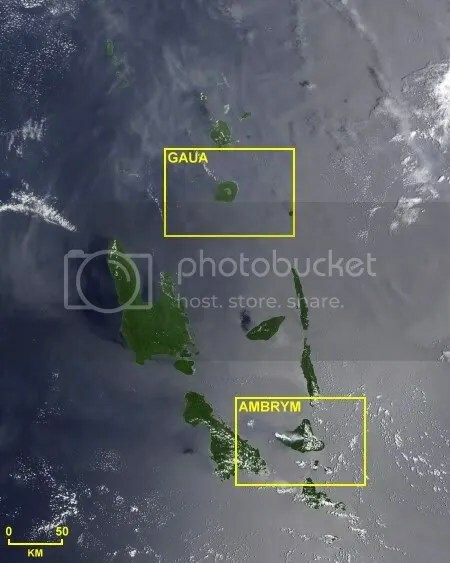 Posted by admin in Ambrym, Gaua, NASA Earth Observatory, Pacific, Vanuatu. 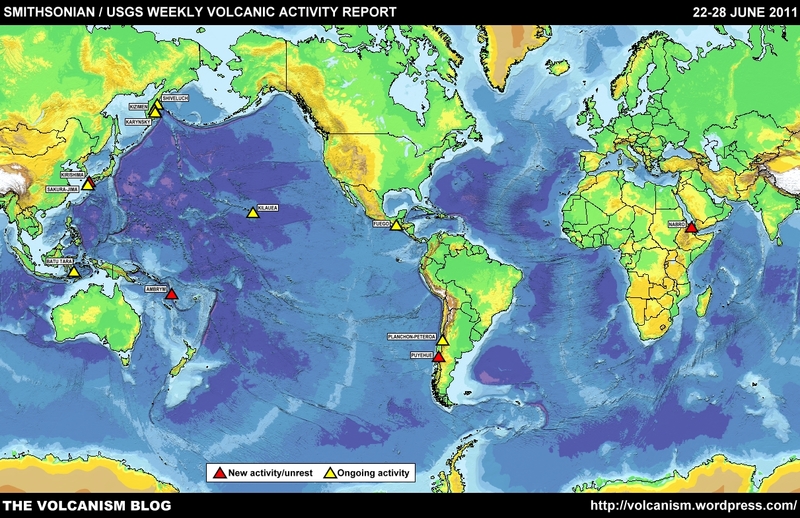 This image, from the NASA Earth Observatory (click on the image to view the original full-size version) shows the northern part of the Republic of Vanuatu in the south-west Pacific. 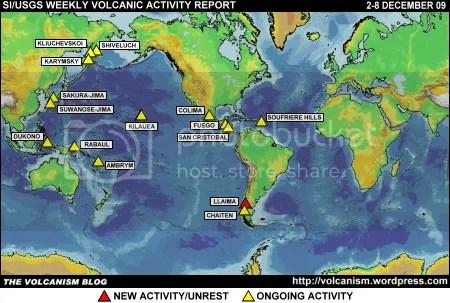 It was acquired by the Moderate Resolution Imaging Spectroradiometer (MODIS) aboard NASA’s Terra satellite on 3 December 2009 and shows two currently active Vanuatu volcanoes: Ambrym (bottom right) and Gaua (top left). Detail views of both are shown below. 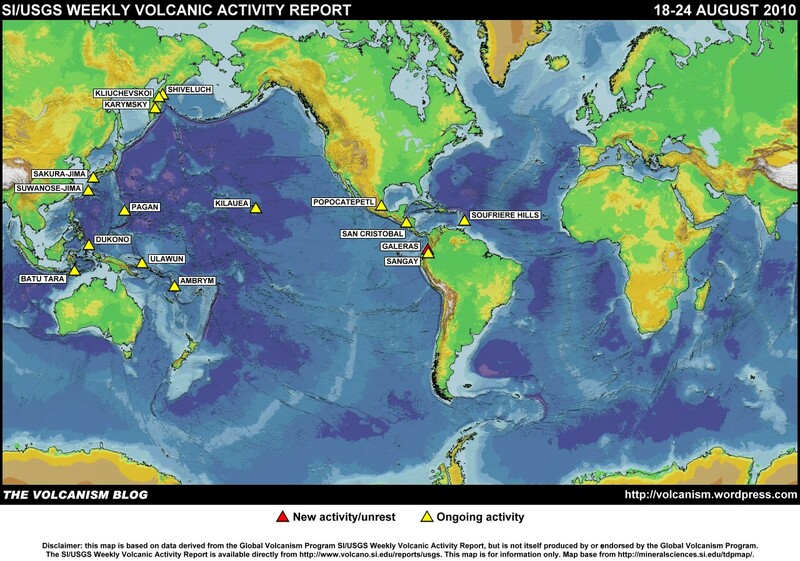 The current eruptive phase at Ambrym, which has a history of frequent eruptions over the last 2000 years or so, began in May 2008; an earlier Earth Observatory image showed an instance of the vog that Ambrym’s sulphur dioxide emissions can produce. Gaua, meanwhile, which last erupted in 1982, has been restless since the autumn of this year: evacuations were recently ordered when gas and ash emissions from its active cone (Mt Garat) were making life impossible for the inhabitants of nearby villages. Another very active Vanuatu volcano, Yasur, is out of shot to the south. 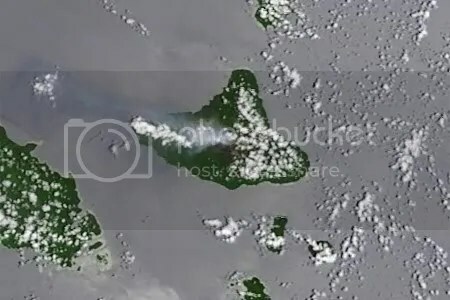 Above: Ambrym volcano, Vanuatu, emitting a thin plume to the west on 3 December 2009. 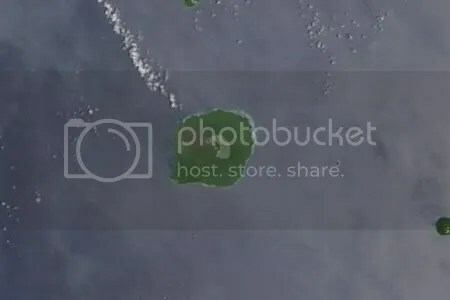 Above: Gaua or Santa Maria island and Gaua volcano, Vanuatu, on 3 December 2009. The lake partially filling the 6 x 9 km caldera has developed a crescent shape because of the construction of the currently active cone of Mt Garat. The brown marking on the western side of the island shows where recent gas emissions from Mt Garat have caused damage to vegetation.